Connect your home or business to the only gigabit-fiber broadband network built and maintained in Santa Cruz County. Great for VoIP, Skype and other cloud-based applications. Wireless Pro is Cruzio’s next-generation high-speed broadband solution. Depending on your location, we can connect you to our fiber backbone via wired or wireless technology and provide unparalleled upload and download speeds, reliability for a low price. Absolutely! We know that the neighborhoods of Santa Cruz are packed with home offices, businesses and freelancers — not to mention gamers, movie buffs and hobbyists — who all need super-fast and reliable broadband. How fast is Wireless Pro? Fast! And getting faster. 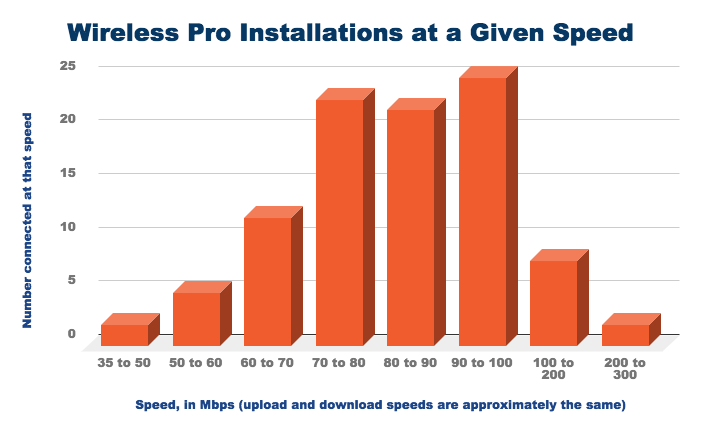 We use to describe Wireless Pro as an “up to 50 Mbps” speed, but after performing pretty serious network upgrades we’ve found that most people get 75-100 Mbps or more – upload and download. That’s right, unlike cable and DSL, Wireless Pro is fully symmetrical so you won’t get hung up uploading big files or video chatting with your family or the office in Madrid. As standard practice, Cruzio automatically upgrades all our users to the fastest speeds available whenever we upgrade our network. And we’re always looking at the newest technology to deliver faster speeds to our customers. We’re growing our network all the time and already have solid coverage from Westside Santa Cruz to 41st Ave. Wireless Pro is also available in Watsonville and some areas of Scotts Valley. Fill out the form or give us a call and we’ll let you know what services are available to you. Do I need to purchase any new equipment? Nope. We provide everything you need to get online. There are no setup fees and no equipment to buy. The only thing you might want to purchase is a wireless router if you want wifi coverage. We do rent them for $9.99/month, but any standard wifi router will work just fine. Is this an “introductory” price? No. That’s the price, it won’t hop up in 3 months time like with the other guys. Am I locking into a contract? No contract. We don’t need contracts with a service this good. We think you’ll love our fast internet but if you don’t we certainly won’t force you to keep it. If you decide to cancel within the first 30 days, we’ll refund everything you’ve paid. Cancel anytime with 30-days notice. What if I need faster speeds? Check out our Enterprise Internet products. Cruzio is the high-speed broadband provider in Santa Cruz County and we offer the fastest speeds available. What about data caps and overages? Absolutely not. We won’t cap your usage and we never charge for overages on this service. Does it include phone service? No, our Wireless Pro is pure, unadulterated internet. No phone or other services come with it. If you need home phone, either look into VoIP options (we’d be happy to suggest some local companies) or look into our Velocity Internet + Phone service. Will it work well for VoIP? The low latency of this service makes it ideal for VoIP and other cloud-based services. Is this service suitable for video conferencing? It’s ideal. The upload speeds we provide are much higher than you’ll see with any similarly-priced business service making it perfect for video-conferencing. Can I watch Netflix using this service? Of course! With this beefy business-grade connection at your home, you can say goodbye to buffering and that annoying spinning wheel. I’m a big gamer, is this a good service for me? It’s perfect for gamers. High upload and download speeds + static IP + super low latency = ideal gaming environment. Believe us, we have a lot of gamers here at Cruzio and they love this service. A single static IP comes standard with the connection and up to 5 more can be added. Is Cruzio working on delivering even faster speeds? Always. Delivering the fastest speeds possible at prices everyone can afford is our mission. As new technologies emerge you can bet Cruzio will be at the forefront in Santa Cruz County. Are wireless connections affected by the weather? Not to any great degree. We only use top-of-the-line hardware and we only ever deploy it at distances around half what is recommended. We’re very conservative when it comes to quality and reliability. If you are having issues, give us a call. Is this wireless stuff harmful? Absolutely not. All available evidence today — according to the FDA, the World Health Organization (WHO), the Environmental Protection Agency (EPA), the Food and Drug Administration (FDA), the National Institute for Occupational Safety and Health (NIOSH) and the Occupational Safety and Health Administration (OSHA) — suggests that there is no correlation between low-power wireless use and health issues.